Signs of hope are beginning to spring up all around us. There's hope in the American flag, raised by firefighters on top of a charred and barren mountain. There's hope written on the driveways and twisted sidewalks that wind through annihilated neighborhoods where houses once stood. In one driveway, someone created a giant heart out of the blackened, broken bricks of their home. On the sidewalk down the street, written in ashy soot, are the words "WE WILL REBUILD." There's hope in that herd of cattle which couldn't be evacuated in time. Frantic ranchers drove their trucks through every fence they could find, hoping to make an escape route. Days later the entire herd was found together on the deserted street below, thirsty but alive and well. There's hope in the sweet smell of rain wafting through the open window as I write this. Perhaps the story which pulls hardest at my heart, though, is that of a man who lost his father the very morning of the fire. Can you even fathom trying to pack and evacuate with that on your mind, your heart? Fate can be so, so cruel. His home burnt to the ground that night, along with each and every treasured memento of his father. Yet, behind the desolate ruins of his house he was amazed to find his vegetable garden unscathed, green, and thriving - watered, no doubt, by the very same fire hoses used to fight the raging beast. His tomatoes were ripe and ready to be picked. As the signs of hope and life begin to emerge from the ashes, so my appetite begins to return. Therefore, in honour of the man who lost everything except his tomatoes, I share my favourite tomato recipe. It's a simple Marinated Tomato Salad, the perfect summertime dish when the garden is bursting with sun-ripened tomatoes. In the bottom of your serving bowl whisk the olive oil, vinegar, mustard, garlic, salt, and pepper. Cut each tomato into 6 - 8 wedges. 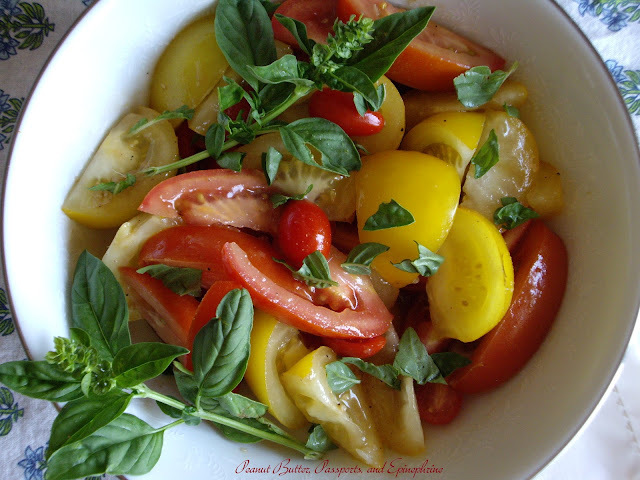 Toss the tomatoes in the vinaigrette and tear the basil on top. Cover and refrigerate 4 hours. Serve. This really is best served within 4 - 6 hours. Don't make it the day before, as the tomatoes begin to break down and become watery. However, if you have leftover tomato salad, here's what I do for a delicious lunch the next day . . .
Preheat your oven to 400 F (200 C). I do this in the toaster oven. Place the bread cubes on a baking sheet. Drizzle with olive oil and sprinkle with a little salt and pepper and herbs. Toss to coat all the cubes. Bake for 10 minutes, turning once half way through, until golden. Watch them carefully so they don't burn. Cool. 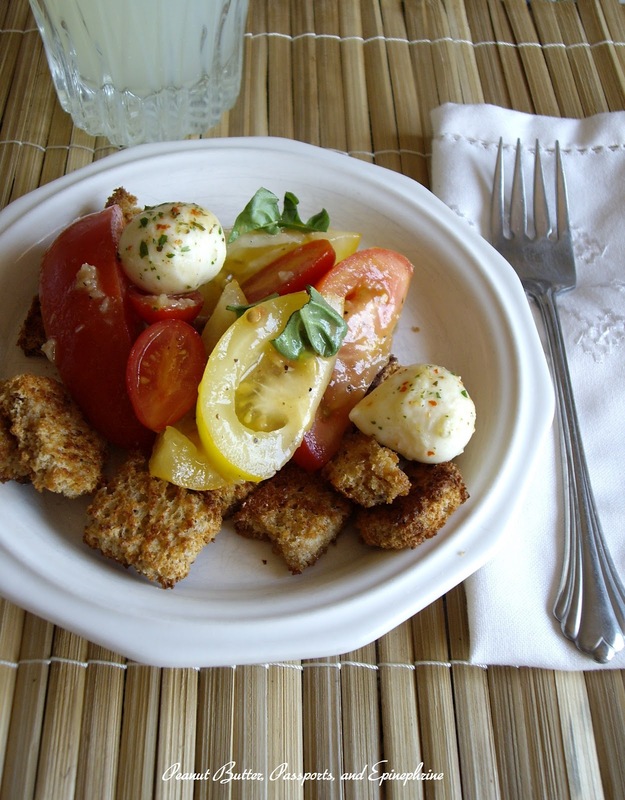 When ready to serve, toss the bread cubes and cheese with the tomatoes. Serve immediately. After reading your post hellish inferno, these tomatoes are just a godsend. I am pinning this post to share so we all remember to enjoy the tomatoes of our lives. Thank you for sharing this awesome recipe and moving story at Freedom Fridays. Thanks, Evelyn! And thanks for pinning it. Hope can be found in the littlest things if we just look for it. Have a wonderful day! Rebecca this look so wonderful fresh and delicious. Hugs!!! Delicious and simple! Tomatoes have such amazing flavor, and i like how this keeps it simple to let the tomatoes shine. Thanks for sharing this with Summer Salad Sundays, look forward to seeing you again soon! Your right! Tomatoes are so good by themselves, the simpler the better. Your post moved me to tears. I was so sad to hear about everything that happened in the fires. I am glad for the hope that people have, and for their strong spirits. The tomatoes are beautiful, and I love the salad you have shared. Simple pleasures are the ones that really are best, and never more so than after something terrible happens. Thank you, April! Yes, the people of Colorado have come together like never before. Thanks! I'll stop by this Friday. Awesome tomato collection! Hope you have a fantastic week and thank you so much for sharing with Full Plate Thursday. 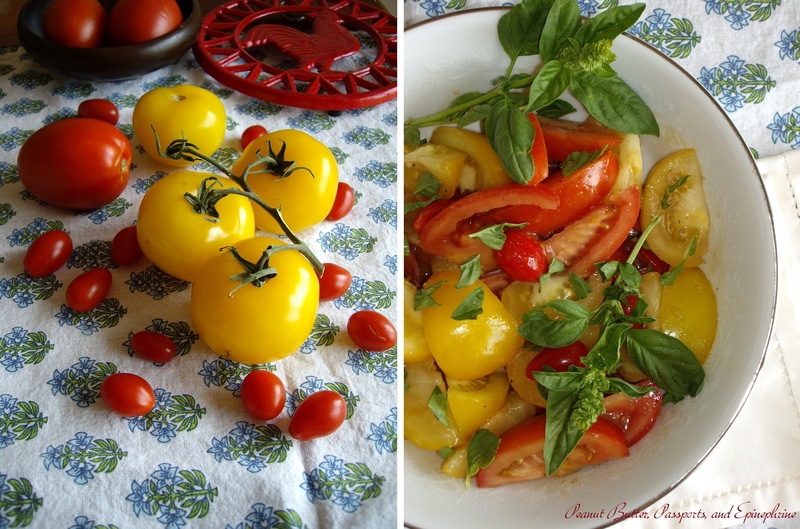 Your tomatoes are gorgeous! Both salads look incredible! A lovely tribute to those who keep putting one foot in front of the other despite unimaginable obstacles. And thank you for the tomato recipes. Can't wait to try both! Thank you! I hope you enjoy them both! I will never look at tomatoes the same way again thanks to your beautiful post. I was moved to tears by your words of the man losing his father at such a difficult time. Tomatoes from this year on will no doubt hold very special significance for this man...and the garden an even greater reminder that there is hope and life after tragedy. Thank you for sharing your account. I am sharing this one with others this morning. Thank you so much for your kind words, Patty. And thanks for sharing my story. From the ashes springs new life, and we're already see that here. Have a wonderful day!